Winter’s coming, so south to the border we go. 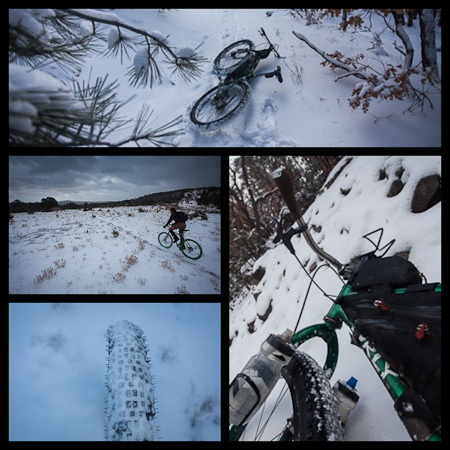 The Krampus, now complete with Rabbit Holes ‘n Knards fore and aft, proved to be the perfect steed for the occasion, carving through snowy singletrack with conviction and aplomb. The day turned out to be an equally appropriate opportunity to test out my platform pedals – the VP ‘Thin Gripsters’, purchased via Rivendell Cycles. Winter riding, here I come. Jeremy was riding a Vicious Cycles early days 29er, lent to him by Dave at the most chilled purveyor of bicycles I know, Mellow Velo of Santa Fe. Note sticker that commemorates the Vicious’ 70th anniversary – in dog years, that is. Angular yet sleek, the Thin Gripsters (technically known as VP-001s) are just as their nickname suggests – thin and grippy. Sealed bearings are velvety smooth, and they come complete with adjustable screws that dig deep into the soles of your shoes. Although riding without SPDs is sure to take some time getting used to, I’m looking forward to how much more practical it will be for overseas touring, and the inevitable hike ‘n bikes I always land myself in. 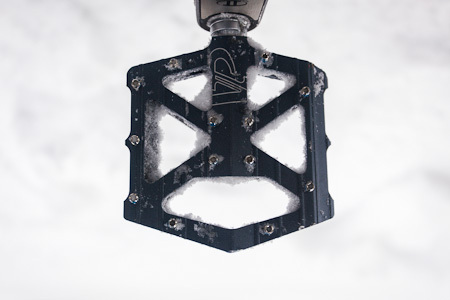 Low-pressure Knards proved to be well suited to the powdery conditions. 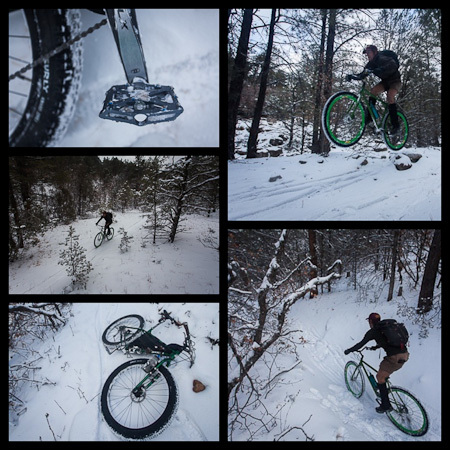 We carved our way down the snowy trails, spraying a haze of snow-flecks in our wake. Almost lost… Jedi-style riding by starlight. I received a particularly generous advanced-Christmas present this year, an iPhone no less, the first smartphone I have owned, and one I instantaneously have come to adore. Not least because it allows me to take photos, listen to music and use googlemaps – the hallowed triptych of my existence. These aside, I can make phone calls and send more-than-one-word texts – both of which are a first for me. I’ve now begun the associated duty of fattening up my constant companion with a whole wealth of apps, including a Spanish dictionary, Run Keeper, the Benchmark Roadmap of New Mexico (which includes topo layers), reading matter and podcasts (RadioLab et al). That’s for starters. With the iPhone, I have the capability to tweet too, though whether this will be a regular occurrence awaits to be seen. 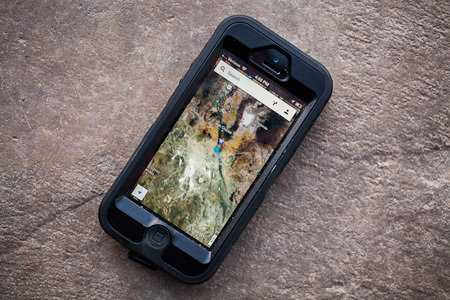 My hallowed iPhone, loaded with GPS goodness. The Plug 2 would make the perfect accompanying gadget, allowing it to be charged on the go. Still, this Guardian article, ‘On the 12th day of Christmas, your gifts will be junk’ makes for a somewhat sobering read, as does watching Annie Leonard’s The Story of Stuff. It’s a 20 minute animated film, with an accompanying website, that’s seems particularly poignant at this time of year. The content is nothing new but no less important for it. It’s a good reminder that if I’m going to create an impact by acquiring Stuff, the least I can do is choose it wisely, think about where it came from, look after it and make it last. For Christmas, we’ve migrated south to visit Sage’s ‘tita’, in El Paso, Texas. I’m also scheming a short solo tour nearby, though I’m not sure yet whether it will be with side of the border or the other. 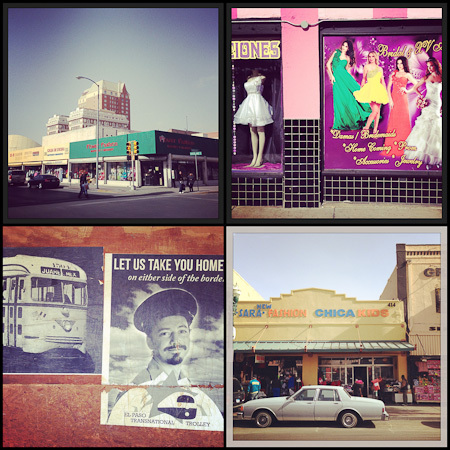 Downtown El Paso: a slice of Northern Mexico. 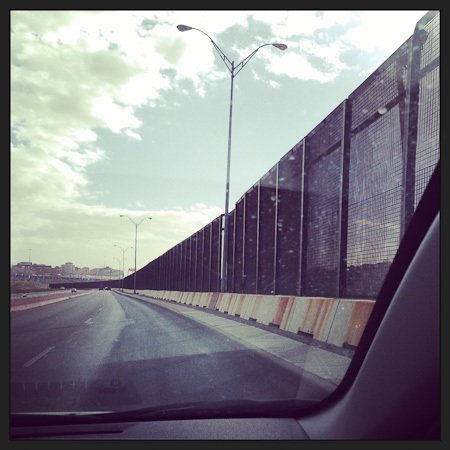 Ciudad Juaraz lies just a hop across the fence. Lunch ($5, inc soup and ice tea) at Rosa’s Cantina. It’s an El Paso institution. The food within. 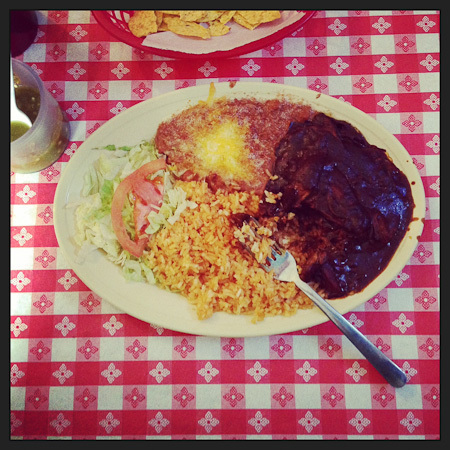 ‘Mole poblano’, a Mexican stew laced with chocolate and chile peppers. Quite delicious. Our soundtrack as we feasted. 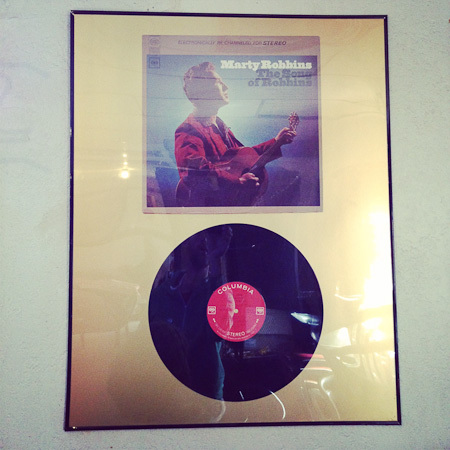 In 1959, Country and Western star Marty Robbins sung a tale of a cowboy who falls in love with a Mexican dancer at Rosa’s Cantina. Sing along with it here. 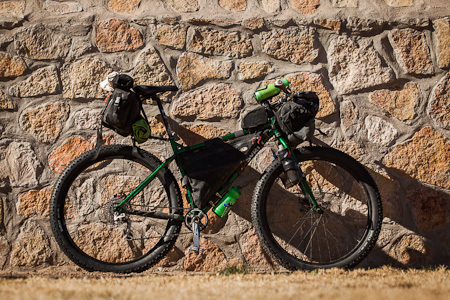 The Krampus will be joining me on my mini-tour, so I’ve garbed it with water bottles and my usual bikepacking apparel. It’s not an ideal setup, as I’ll be running a single chainring (32T) with a 12-36T casette out back – certain to be a challenge in places. Hopefully travelling light will help make up the difference. In a tweak to my usual setup, I’m trying out a Bagman 2 Expedition, a new saddlebag support from Carradice. I’ve used the previous version of the Bagman before, finding it perfect for lightweight road tours, though not sufficiently beefy for dedicated off road use. This new model features struts that attach to the rear rack eyelets of the frame (or a Salsa Rack-Lock seat collar in the case of the Krampus), which should make for a significant improvement. Inspired by the saddlebag-loving antics of Gypsy by Trade, a return to my venerable Super C could well solve the conundrum of packing a Macbook Air – without resorting to a sweaty backpack or clumsy panniers. More on all that when I’ve had a chance to try it out properly. Hose clamps circumvent the lack of water bottle eyelets on the Krampus. An easy and more elegant fix would involve drilling the frame/fork and inserting a series of threaded rivnuts – no brazing necessary. The Bagman 2 Expedition is designed for a traditional saddlebag, both supporting it and ensuring it doesn’t sway against your thighs. There’s a quick release mechanism for speedy saddlebag removal. 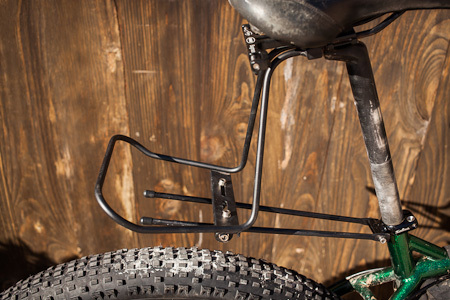 Two struts, attaching to the bike frame’s rack eyelets, provide extra burliness. 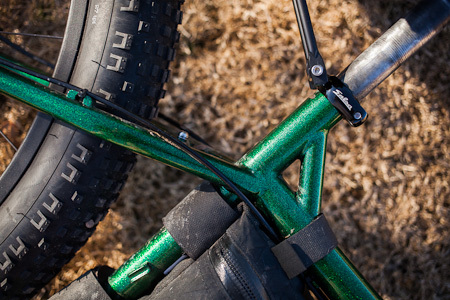 As it happens, the Krampus has fender eyelets but no rear rack eyelets. Salsa’s Rack-Lock is a neat solution. Although on the pricey side ($30), it’s nicely crafted, and the only such collar I could find in the required 30.0 size. 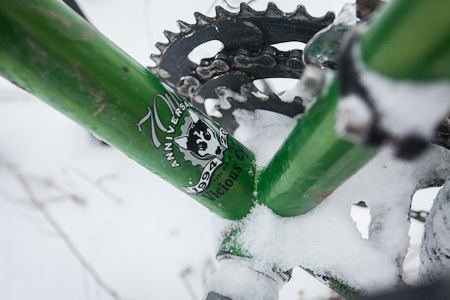 Surly Krampus in bikepacking apparel. Ready to roll, complete with tent, camping gear, stove, fuel, computer, camera and all the rest of my paraphernalia… No backpack required. An object of practical desire, courtesy of Rob English. I can’t wait to see this one built up. Maybe it will appear at the North American Handmade Bicycle Show, held in Denver, Colorado, next February – which I’m hoping to attend. 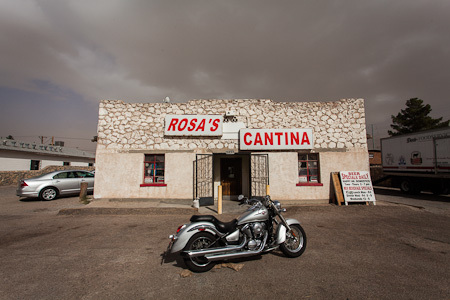 This entry was posted in Bike Talk, New Mexico, Texas and tagged Apple iPhone 5, El Paso, Rosa's Cantina, Surly Krampus, VP Thin Gripsters on December 21, 2012 by Cass Gilbert. I too have just gotten a smartphone. (An Android, as I can’t afford an iPhone right now.) And I read that Guardian story you linked. It is pretty sobering. I’m not a fan of planned obsolescence, and mobile electronics are big offenders. I still own an iPod Touch (basically an iPhone sans phone) and have used it extensively in the 2 1/2 years I’ve had it. But lately some of the apps have been acting clunky and when I looked at updating them, surprise! My 2 1/2 year old iPod Touch can’t handle the upgrades. Which I guess is their way to encourage me to buy a new one. Ugh. I think the thing that gets me the most about planned obsolescence of modern electronics is how useless they become in a short span of time. Right now my iPod Touch is still functional, and will remain functional until it breaks or the battery wears out. But in a couple years most of the apps probably won’t work, which will make it less of use to me or to anyone else if I try to sell it. I realize that yeah, I’ll have to keep on purchasing these electronic gizmos every few years, and smartphones are useful. (Used the maps on mine the other day to make sure I took the right turn on a ride!) I try to buy much of my durable goods second-hand, though. And I love old bikes. I do what I can. Here is a tip for your iPhone. I believe you can’t replace the battery when it’s dead, just get a new phone. Since it is lithium ion, you shouldn’t charge it all the way (that’s the case with my electric car). I always just stick it in for a few minutes and not let it get beyond 80% full, and try to not let it get below 30%. I haven’t seen an option that automatically cuts off the charge at 80%, maybe there’s an app for that. They probably don’t tell you about this because of the whole planned obsolescence thang and they want your phone to die in a few years so you buy a new one. Thanks for the tip Mark. Electronic companies generally claim that miniaturisation is to blame for products not being repairable. After all, there’s a lot to cram in there. I’d be prefer to make the sacrifice and have a slightly larger device, that could still be fixed. Hi Cass, Excellent we are back on the gear topic! Crazy idea to think 99% of “stuff” is wasted after 6 months. I wonder who all these people are? Congratulation on the Iphone. I still use my 2008 3GS and it’s still as good as new in its Otterbox defender case, knock on wood. Regarding the Tout-terrain Plug-2, the Iphone is very particular about it’s power source, so I’d like to hear from others first if the combo works or not. Being German it might well work though. Great pictures as usual and congratulation on having become a father as well. How very fortunate. Stijn, it seems there’s a ‘Plus’ version, designed with smartphones in mind. If it works as nicely as it seems to do, it would make a great combination. Definitely something I’d like to explore. 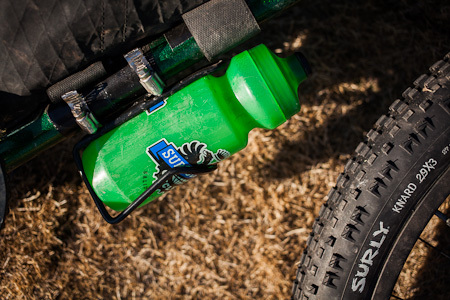 I’ve used riv-nuts before for above the toptube bottle mounts but never for a below mount. I’m concerned that the weight of our big 1 1/2 liter bottles under the downtube may be too much weight for the ‘nuts? The upper strap will definitely help though. It will be great to see how they work out for you. Two Wheel Drive or the Coop used to have a riv-nut tool. I used rivnuts for my Anything Cage/64 oz Klean Kanteen. No problems with the rivnuts, but the AC shows some stress cracks. You fitted three rivnuts to run the Anything Cage, right? That would make sense for the weight of a 64oz (1.9l) bottle. I’m waiting on the new improved ACs to come through. Yes, three rivets for the AC. A stronger AC would be nice. Brazing them in would definitely be a more secure, long term solution, but rivnuts appeal for their quick and easy application – without the need for a frame respray too. I agree though, when it comes down to it, hoseclamps make a lot of sense. I just find them a bit fiddly to instal and remove regularly, they’re (relatively) heavy and they look kind of ugly – none of which are major issues though. Is there a rumor (rumour) of a redesigned Anything Cage? I just emailed Ron w/King Cage to see if he’ll build us some. I asked Mr King Kage about a triple-eyeletted cage last year at the Sacramento handbuilt show, but he didn’t seem keen. The one I have is perfect (http://whileoutriding.com/2012/05/15/back-but-going/), I’ve not had any issues with it, so it would be great if he made more. At Interbike, Salsa mentioned a new model (or two) that they had scheduled for November. I guess it’s been pushed back but hopefully is still on the cards. I use Powergrips straps for my platform pedals and I don’t really miss the clipless pedals, although I don’t do so much technical riding anymore. You have to take the screw spikes off that side of the pedal or your feet don’t slide in. I have some Powergrips at home I used to ride with, I’ll have to see if I can dig them out and rediscover them. It would be a shame to lose the platform screws though, as that’s what I like so much about these pedals, compared to traditional touring ones I’ve used in the past. I guess I’ll see how I get on over these next few weeks. So far, the Thin Gripsters seem great. I enjoyed this read. 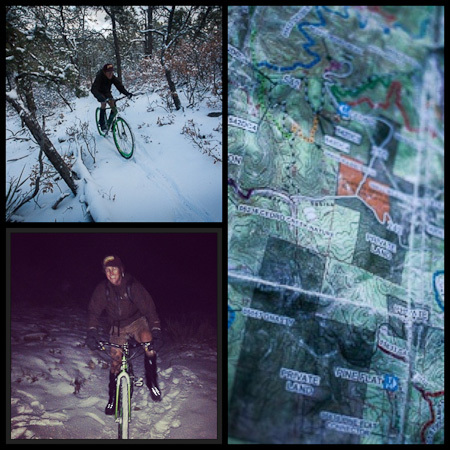 It has been a pleasure seeing you showcase some NM scenery and trails, so often overlooked. I’m down here in Las Cruces, if you ever find your way in our area again and want to connect to ride or bikepack, shoot me an email. I’ve spoken with Tim Nelson a few times, to pick his brain, but haven’t had a chance to ride with him. Anyways… take care. There’s a possibility I may be passing near Las Cruces if I end up riding to Silver City. Will let you know! Have a good xmas. Hola Cass, que tal? yo disfruto mucho tu blog. Las fotos, y el material es buenisimo. Me and Audrey are heading down to Venezuela with a couple Trolls to bike the Andes for a bit. Your site has been super useful and inspirational. Cuando vas a SurAmerica otra vez? Hi Marco, thanks for your words. I’m sure your Trolls x2 will have a great time on the rugged roads of the Andes. Which route are you taking? 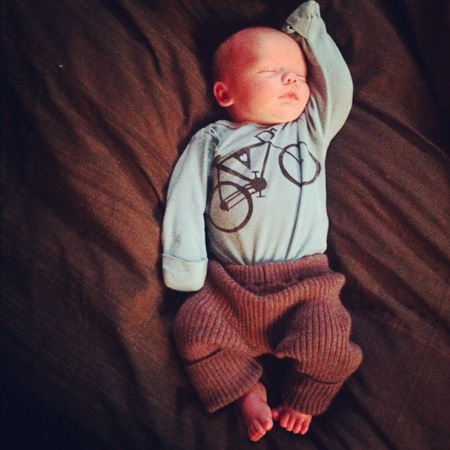 I’m hoping to be back in South America sooner rather than later… ps Sage is a boy! Oh, my bad, apologies. Is Sage boy your son? We are staring in my hometown, Merida VNZla, on to Colombia, Ecuador and so on. I would like to go to SIerra El Cocuy in Colombia. Just as your good self, the farther up a mountain the better! Cool! I was in Merida some time ago, maybe in 1995 or so, when I was backpacking around Guyana, Surinam and Venezuela. I climbed up Pico Humboldt and went horseriding – a beautiful area. Nice, your horseriding guide….was he a tall&skinny French-Austrian dude called Jacky? A neighbor and good friend of mine. His farm is called Finca Yegua Blanca in la Poderosa (with direct view of Pico Humboltd, actually). I cant wait to go up and down, across, in and out, and through the lil’ mountains of Merida with the trolls. Neverending paths up there. Up 4200mts to sea level. Marco, do you have any more info on your trip to Atlin lake and the Juneau icefield? I’ve been fantasizing about paddling down to the end of Atlin Lake, then crossing over to Sloko Lake and then continuing down the Taku River to Juneau. But it seems there might be too much white water in the upper reaches of the river. The Bagman looks interesting. I’ve always been interested in some way to carry a mid-sized backpack with me without a rack – would it work with a Bagman? It seems designed for something a bit wider and shorter than a typical pack. Phil, have you come across the Tout Terrain’s Sherpa 2 rack? Could be better suited, as it looks to allow access to a backpack when attached. Thanks Cass, I hadn’t seen that before, looks perfect. Oh, and have a wonderful Christmas! Do the Gripsters spin well straight out of the package? I just got a pair and they seem stiff. Thanks so much for sharing your adventures and your SUPER thorough reviews! It’s great to be able to chat with someone who has experienced so much. I couldn’t find any reviews on how the Bagman held up on this trip? I’m headed out on the Divide this summer and am struggling between the OMM Sherpa rack and the Bagman for my camper longflap. I have an old Nitto M18 but I’m not getting enough clearance on my Krampus (med).